A-MAX Security Solutions is dedicated to being Portland’s automotive locksmith expert. We offer automotive key making services that get you back on the road faster. It is no longer necessary to tow a vehicle to the dealer due to a lost or damaged car key. A-MAX Security Solutions has unmatched knowledge and expertise in transponder key programming and key making services. Auto manufactures have made Immobilizer security systems a standard feature in almost every new vehicle model made today. 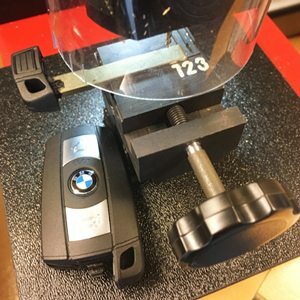 Locksmiths normally struggle to make keys for Audi, BMW, Fiat, Lexus, Mercedes, Porsche, SAAB, Toyota, Volkswagen, and Volvo models. A-MAX has the expertise and equipment to make all of these types of keys quickly and efficiently. We have invested in the latest transponder and chip key tools and equipment. We have dealer level scan tools, aftermarket programming, and Electrically Erasable Programmable Read-Only Memory (EEPROM) equipment that provide us with full dealer lever access for key programming, Electronic Control Unit (ECU) matching, and module coding services. In addition to our programming services we have on-site and mail-in module services for EEPROM work. Using EEPROM, we can remove the existing immobilizer box from an automobile and write a transponder chip to match the existing module.